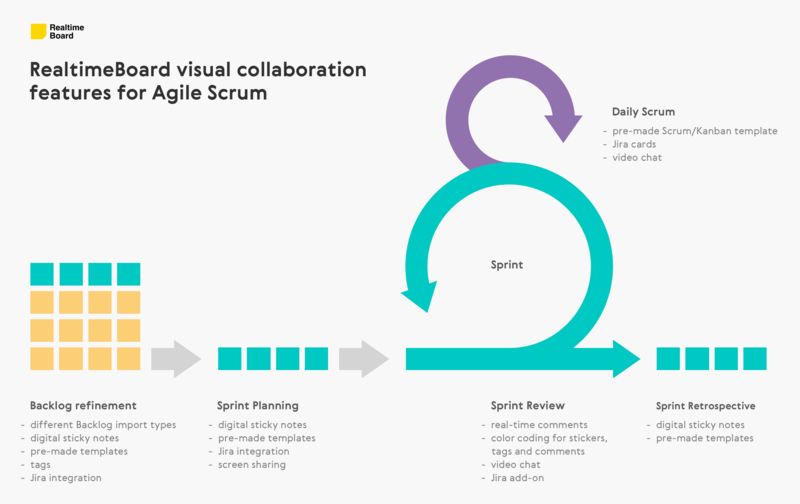 This guide illustrates the process of setting up and using an online whiteboard based on the widely used Agile Scrum approach. In this guide, we review the basics of each event and provide examples of how visual collaboration helped our clients enhance their Agile process or helped overcome the challenges of remote teamwork. 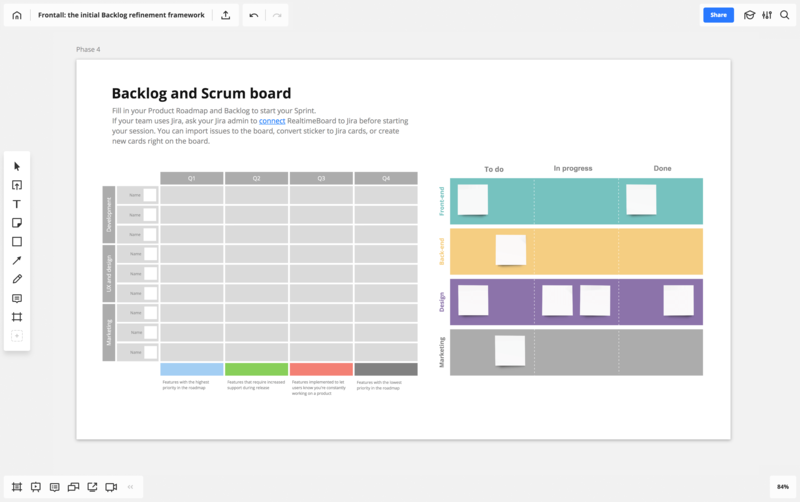 You’ll also find instructions on how to set up a similar process for your Scrum Team using RealtimeBoard. The Agile process begins before the first Sprint is initiated. The official Scrum Guide™ calls this stage “Product Backlog refinement.” Your team needs to know how to design the three types of this meeting. We asked one of our clients, Lieuwe van Brug, co-founder of Frontall.io and an experienced Agile coach, to share the framework he uses to lead clients through the most complicated meeting – the initial Backlog refinement. To ensure the Product Backlog is healthy. In a healthy Product Backlog, the items that will occupy the Development Team for the upcoming Sprint should be refined so that any one item can reasonably be “Done” within the Sprint time-box. You can plan a Backlog refinement meeting whenever you realize that a Backlog needs revision. This activity occurs on a regular basis and may be an officially scheduled meeting or an ongoing activity. Backlog refinement includes the following tasks. Redefine and confirm remaining stories. Review the estimated time required for each story. This case study is written by Lieuwe van Brug, co-founder of Frontall.io and an Agile coach. The first phase of the refinement process is ideation. It is usually discussed among the business, Product Owners, architects, tech leads and, ideally, clients. Based on my experience, all the items a team generates during this phase are mostly ideas, wishes or hunches. They always need refinement and customer validation. This phase of the process is flexible and can be chaotic. For idea generation, you can use different brainstorming methods and categorize the ideas in a convenient way. For example, you can use the “six thinking hats” of de Bono as a brainstorming method or a vague, concept and concrete idea template for clustering ideas. I usually start the ideation phase by creating a board in RealtimeBoard and adding pre-made templates or creating my own. With an online whiteboard, even remote team members can actively participate by adding ideas, leaving comments and taking part in discussions. Phase 1 – Brainstorming can be done in many ways. One example of a brainstorming technique is de Bono’s six thinking hats. Make sure that the ideas are concrete and clear. The next (optional) phase is validation. After the brainstorming is done, the implementation of the idea is still full of assumptions. A discussion or workshop with real customers is a good idea to validate those assumptions. I also prefer to use RealtimeBoard for this phase, as you can connect with users or customers remotely, share screens and discuss the scenarios freely. 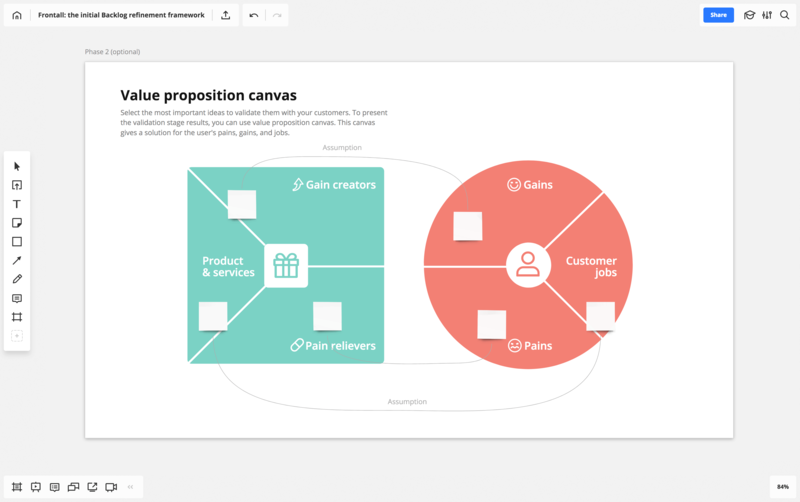 To present the results of the validation phase, you can use a value proposition canvas. This sets your solution against a visualization of the users’ pains, gains and jobs. Phase 2 – Ideas are full of assumptions that they can resolve users’ pains, gains or jobs. Select the most important ones to validate these assumptions with your customers. The third step is to create a user story map based on the selected ideas from phase 2. I used a pre-made template, but you can create your own. User story mapping is usually done by the Product Owner and Scrum Team, when a rough idea is refined to user tasks. The idea moves toward real implementation at this point. After the previous steps are complete, the user story is ready to put in the Backlog. If your team uses Jira, you can activate Jira integration in RealtimeBoard and convert stickers with user stories to Jira cards within the board. Depending on the project, we either keep a Backlog visible on the board or move it to Jira (or any other tool the client’s team uses). The refinement stage is now complete, and you can start your Sprint. Parallel with the Sprint, you should start a new refinement process. 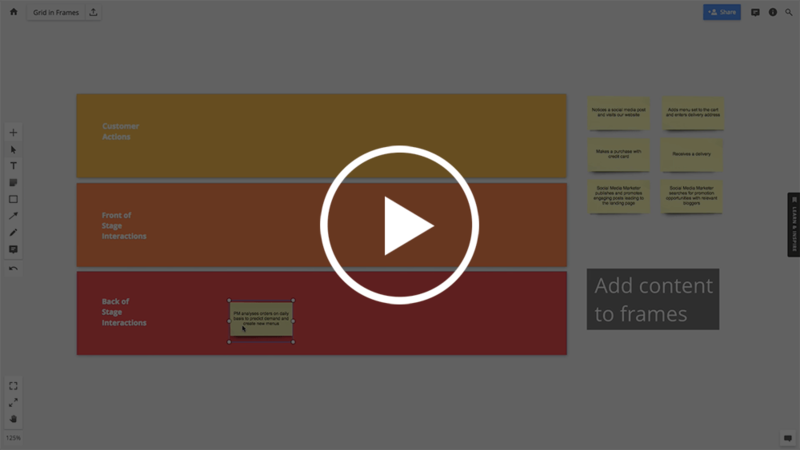 Phase 4 – Now you can fill your product roadmap and Backlog to start your twice-weekly Sprints. You can also integrate with Jira to show the cards on the board. User stories are frequently documented in text format because of the user story mantra. Running every phase on the board helps the team and me use visual aids throughout the process. My advice is to incorporate visual collaboration and “draw” to your teammates more often, even if they are remote. You can simply copy the Product Backlog refinement framework described above by clicking the button at the beginning of this chapter. If you want to design your own custom framework, follow the steps below. 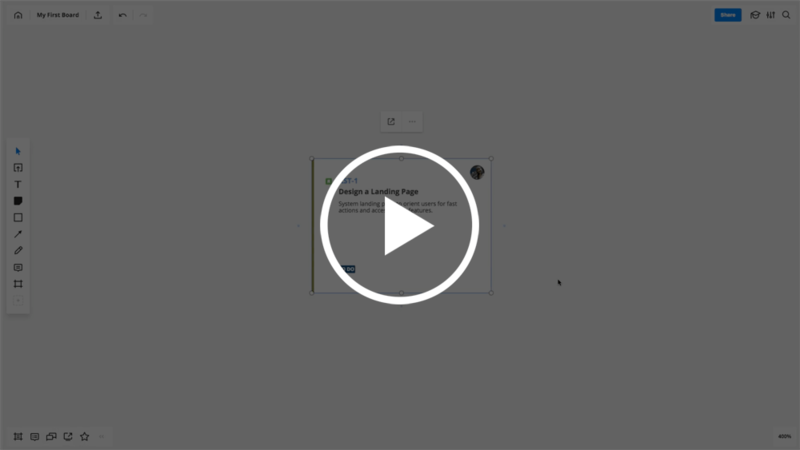 Create a new board and invite your team members by opening the “Share” settings. When they accept the invitation, every individual edit is viewable and saved. 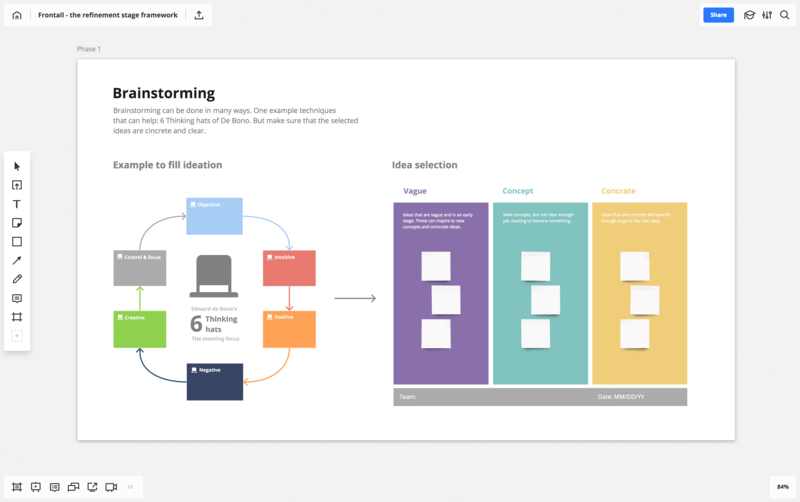 Add a brainstorming template from our template library. Simply press the “plus” icon on the left toolbar > Templates > e.g. “Six thinking hats.” Or create a custom template using shapes, sticky notes and text. 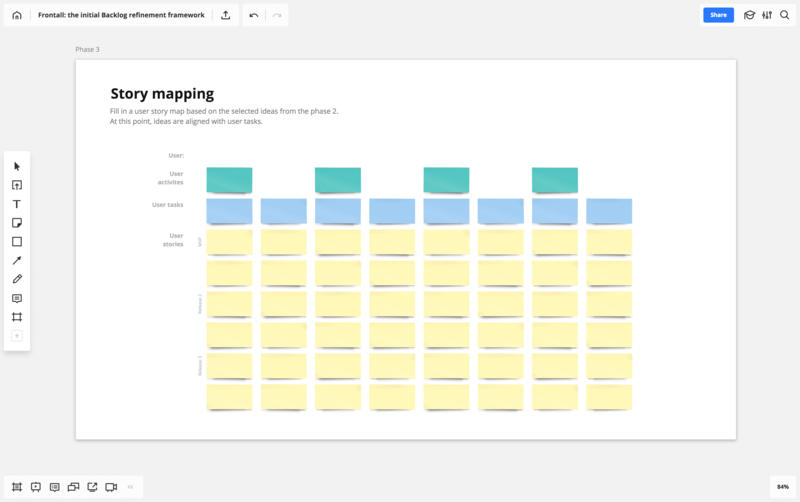 Add a user story map template from our template library. Simply press the “plus” icon on the left toolbar > Templates > User story map. Or create a custom template using sticky notes. Keep your Backlog visible on the board or move it to Jira (or any other tool your team uses). 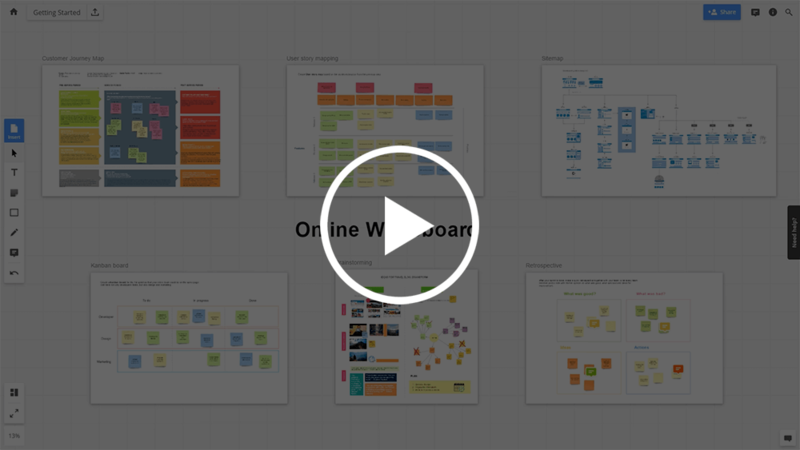 To keep the Backlog on the online board, organize content using frames, shapes and links. If you would rather not use the six thinking hats of de Bono, choose one of the pre-made templates from the template library: “Brainwriting,” “5 whys,” “Mind map,” etc. Click on the “sticker” icon on the left toolbar > choose the “bulk add” mode and start typing away. Click “Done” when you are finished, and your ideas will be added to the board as stickers. Use tags or emoji to cluster and estimate the stories. 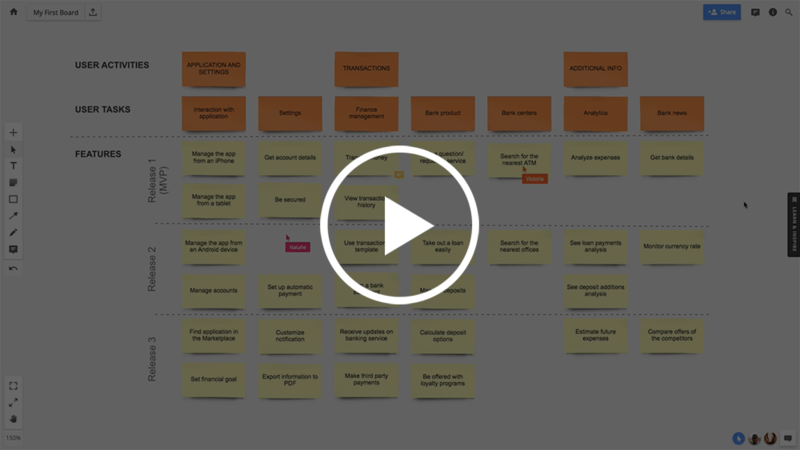 Read how Ron Lichty, an Agile expert, estimates user stories in RealtimeBoard via digital stickers and tags. If you did a previous Backlog refinement session on a physical whiteboard using sticky notes, simply transfer the results to RealtimeBoard. Open the RealtimeBoard mobile app for iOS or Android and choose the “capture notes” feature to take a picture of the paper sticky notes, which will then be recognized as digital stickers on the online whiteboard. Does your team use Jira? Before to start your session ask your Jira admin to connect RealtimeBoard to Jira. You can import issues to the board, convert sticker to Jira cards or create new cards right on the board. To import existing Jira issues to the board as cards, copy each issue’s URL and paste it to the board, or open the list of issues by clicking the Jira icon in the RealtimeBoard library. Convert stickers with user stories to Jira issues. 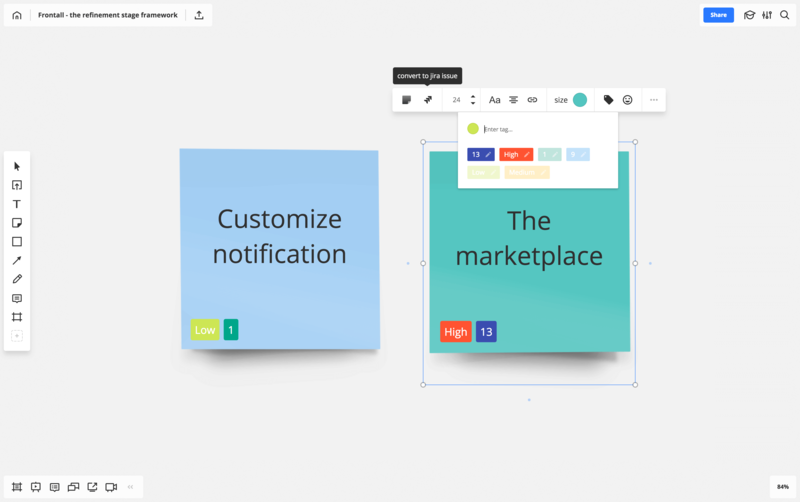 With the click of a button, RealtimeBoard stickers are converted into Jira cards and automatically synced. This is especially useful if you groom your Backlog via stickers. Divide tasks into sub-tasks and reflect these in Jira. As you groom stories in RealtimeBoard, you may need to split tasks into sub-tasks and reflect these in Jira. To do so, simply create a new card using the card picker. Click “Jira” in a library to open the picker and choose the “Create” button. Once you create a card in RealtimeBoard, the corresponding issue will be created in Jira, with all the changes synced automatically. Validate your ideas with customers on the board. You can connect with users or customers remotely via the online whiteboard, share screens and discuss the ideas that need to be validated freely. Before reading further, remember the advice of Lieuwe van Brug about the importance of incorporating visual collaboration and “drawing” to your teammates more often, even if they are remote. Indeed, running the Product Backlog refinement meeting using visual aids throughout the process can help a Scrum Team achieve shared understanding more quickly, even if someone on a team is remote.